Goodbye Stripes! Hello Floral Curtains!! Hi Guys – hope you are all having a great Mother’s Day weekend. We had the whole family over and it was a perfect weather day to sit outside and just hang out! Where did April go? Time is going by way too fast and April was filled with many events. We took a well deserved vacation with my family – which was a blast – it was so nice to defrost on the beach after such a long winter. I was also able to get some projects finally done around the house, which felt awesome! I was even able to paint some furniture outside – which felt like that would never happen again after this long winter! We had some great friends of ours visit last week – which put the pressure on to do some projects around the house before their visit. The first one I wanted to share with you all is that I updated the curtains in our great room – I have wanted to do this for some time. I think the stripe curtains were over 12 years old. Though I loved them – the stripes were getting kinda of dated. 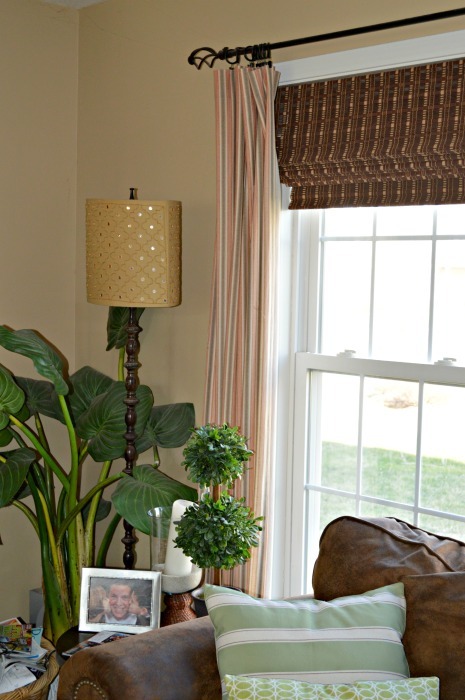 Since I added the brown and lime green curtains to the living area – it really has brightened up the room – which was feeling a little bit dark. Then in February I replaced the dark leather ottoman with the two toned coffee table to add a little bit more depth and color to the space. It is holding up awesome and the kids don’t even miss sitting on the ottoman. 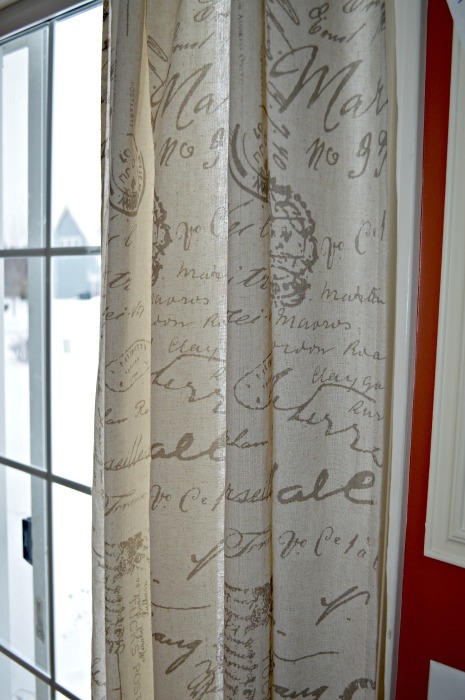 Over the winter I was stalking various fabrics on-line in the process of trying to find the right curtain fabric for the space. Should I go solid, pattern, color, geometric? I looked at everything. I decided on this fabric from Joann’s. It is actually fabric that I have used before as an accent in our bedroom. I love the use of color and the fun floral pattern within the print. It has the brown for the sofas, and the lime green from the pillows. 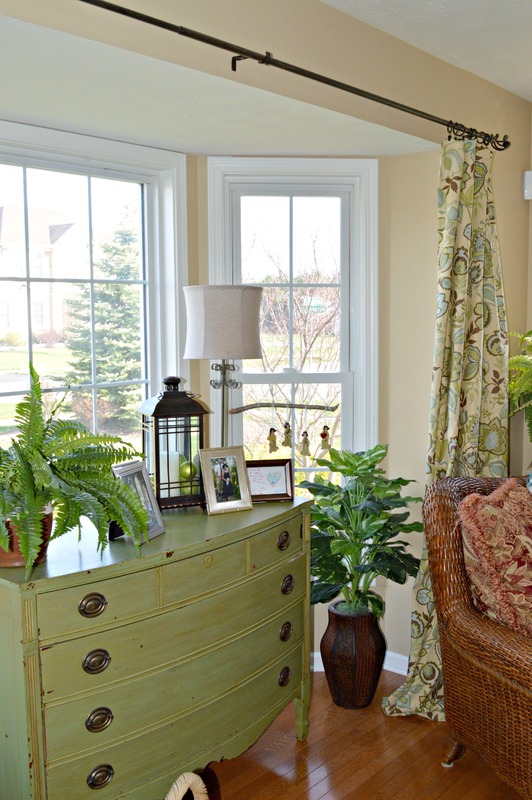 It is amazing how the landscape over the room has changed with the curtains, the room became warmer – not darker and less preppy as my Mom said with the stripes no longer being there. 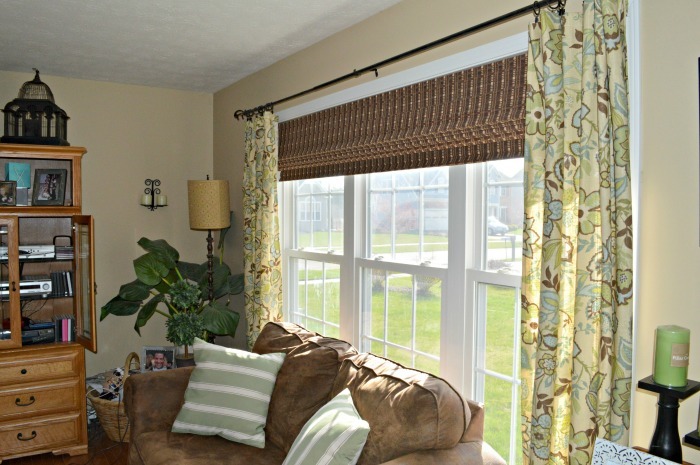 The curtains were really easy to make – for 4 panels at 84 inches in length I needed about 10 yards of material. I had a Joann’s coupon for 50% off so the panels were about $45 dollars a panel – for this type of material that is awesome. 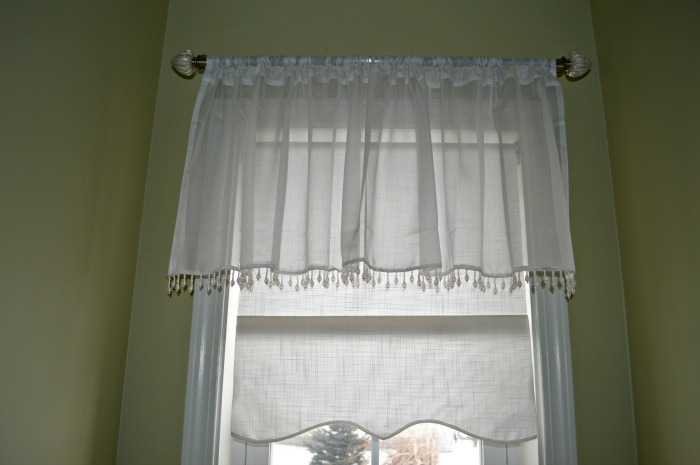 I used rings to hold the panels on the rods which are great to move the curtains back and forth – and I had the rings from the old curtains. I think I bought them at Bed Bath and Beyond – but you pretty much can buy them anywhere now. It took about an hour and a half to cut and sew the curtains together – which is just a Saturday morning and then you have a whole new look and feel to your room. The Color Gray is on the Move…. A couple of weeks ago I mentioned that I really don’t have much gray in my house. 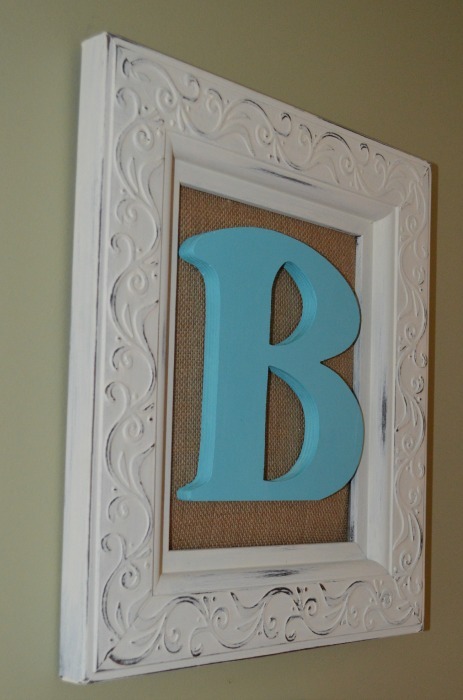 Love the color – but really have not used it in a decorating sense. Well that has sure changed. So it all started around Christmas when my sister gave the Hubby and I each a runner for our Kitchen. With our lovely dog, Linus, runners last us about 1 to 2 years. 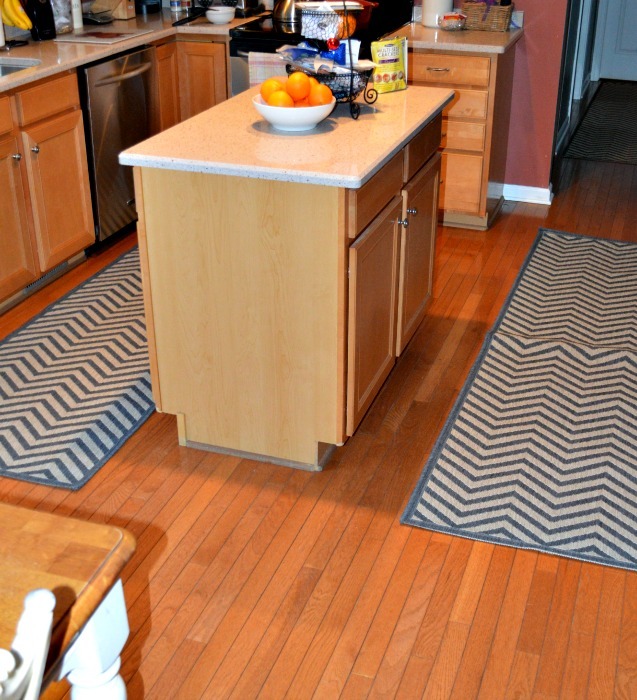 These were from Ballard Designs and I loved the chevron print. 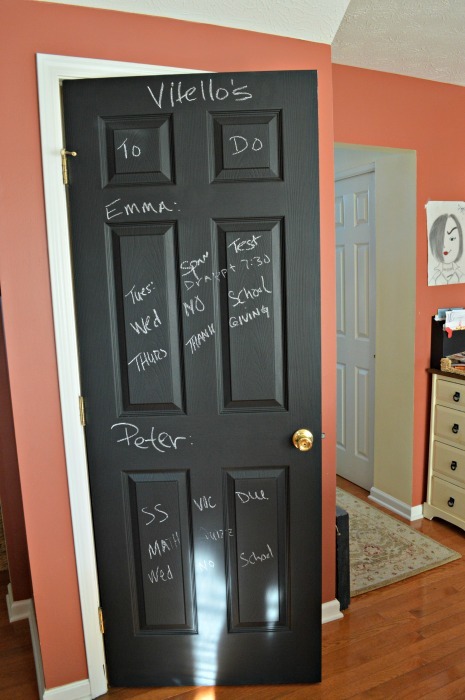 They were $50 dollars apiece and I think she was able to get a 20% coupon as well… Any who I picked gray for the kitchen to tie in with the mudroom area and our chalkboard door (which is a very dark black) that I love. 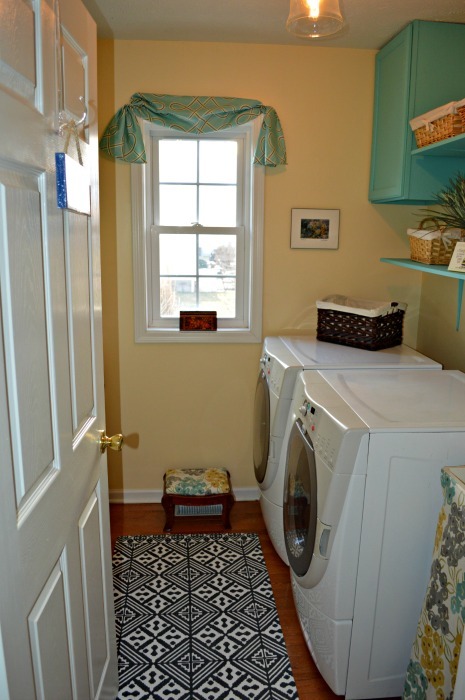 Even though in the mudroom I have the same runner in brown…. Since the chalkboard door is such a deep black – gray really is becoming a nice accent color in the kitchen to balance the richness of the door and the brick red on the walls. 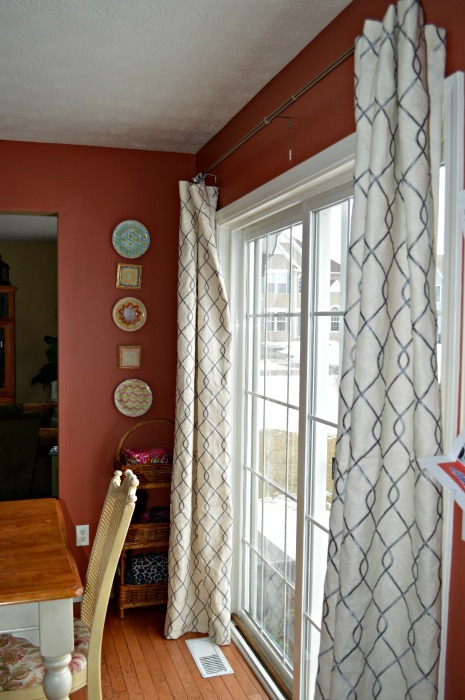 Last year I was tired of the curtains in our kitchen, they were nice lined curtains for Pier1 with more jeweled color tones, they were great at blocking out the light from our patio door but made the room rather dark. So one day I bought these linen ones from Pier1 as well. They had that popular front print all over them but they were really thin and did not do a great job at blocking out the light, and our house is on the corner so as night people can look right into our kitchen. Watch out world! 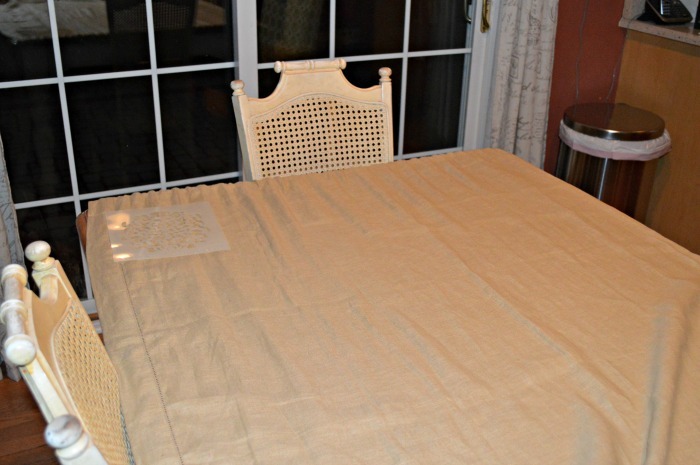 So since I loved how my upstairs bedroom curtains turned out, I thought I would give it a try and make lined curtains for the kitchen as well. I have been courting this material on Onlinefabric.com for a while. I just loved the chain link pattern with the silver gray thread, so elegant but classic at the same time. I thought they would look awesome in the kitchen but the fabric was over $30 dollars a yard which would make each panel $70 a piece. Now I love a spurge but I was trying to be reasonable since my tastes change on a dime. But I loved the fabric and decided to take the plunge and buy the fabric. The material is just awesome! I ordered 180 inches, which is about 5 yards. 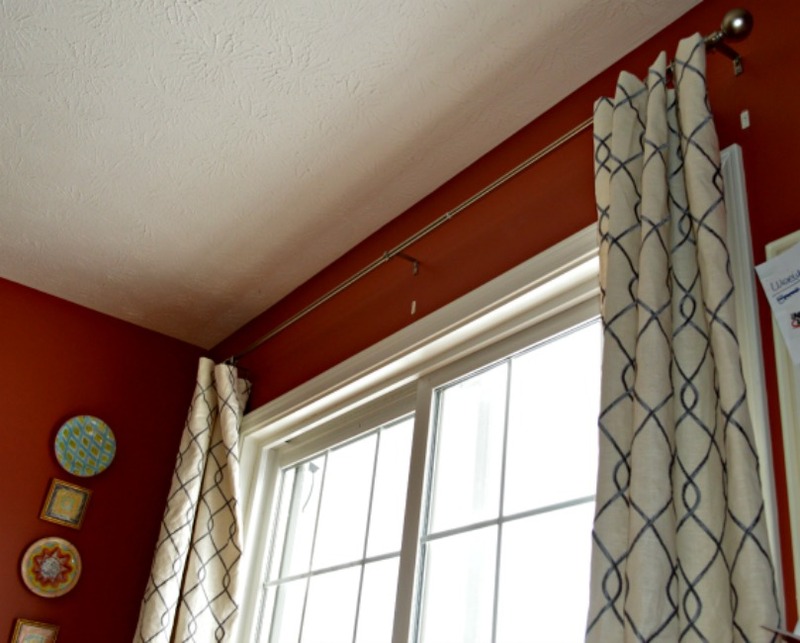 I was making the curtains about 84 inches from the curtain rod to the ground.Like last time I bought two creamed colored twin sheets, this time from Target because Wal-Mart was out – they were a little more expensive: about $10 dollars a piece. 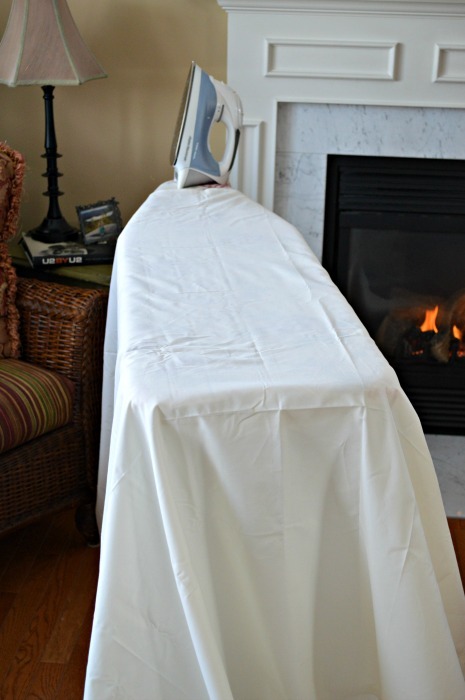 So what you do is take the sheets, give them a good iron to get the wrinkles out. Then line it up on the material that you cut to size. I allotted 2 inches on the top and the bottom to turn over for my seams. Since the material is linen I did iron my seams before I sewed them so I would have a good edge. 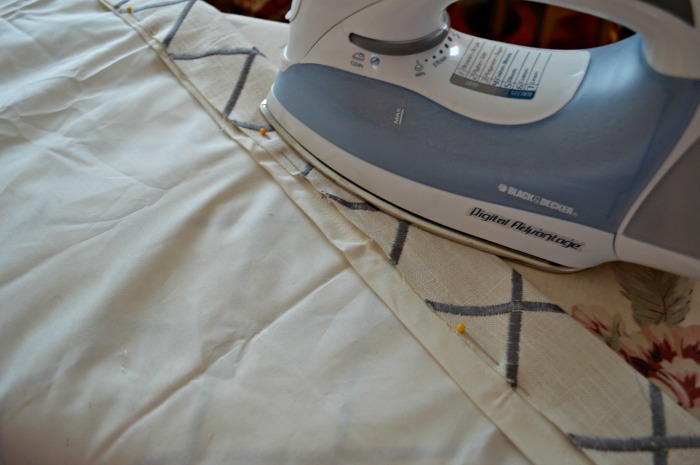 Then you sew all the edges – ironing and measuring really takes the time – maybe about an hour for both panels. Sewing is the easy part you as you just sew straight lines. Since this patio door is the entrance and exit to our outdoor space I wanted to make sure the curtains easily moved on the bar – so I used curtain rings to hold up the curtains. They easily slide from one side to the other. I bought 2 packets from Wal-Mart in silver to use with the curtains and probably need to buy one more packet as well to give it more support. 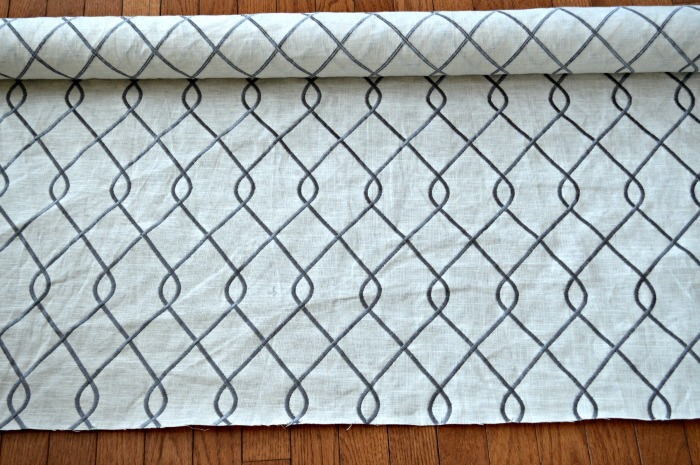 So making lined curtains is really easy…nothing to be afraid of if you are a beginner sewer like myself. The silver gray fits in really nicely into the space and works well with the runners we have in the kitchen. OK – I am sorry, I know an over used title, but I could not resist. Even though I think I am one of the few people in America that did not read the series. I hope everyone had a great weekend. It was another cold one in my neck of the woods and for about an hour a blizzard with whiteouts went through our area…. I got a lot done this weekend which felt great – and even got some painting done which felt even better – more on that later. So, if you can guess based on the title, I am going to paint our bathroom a couple of shades of gray. I did not realize that there were so many shades of gray out there. 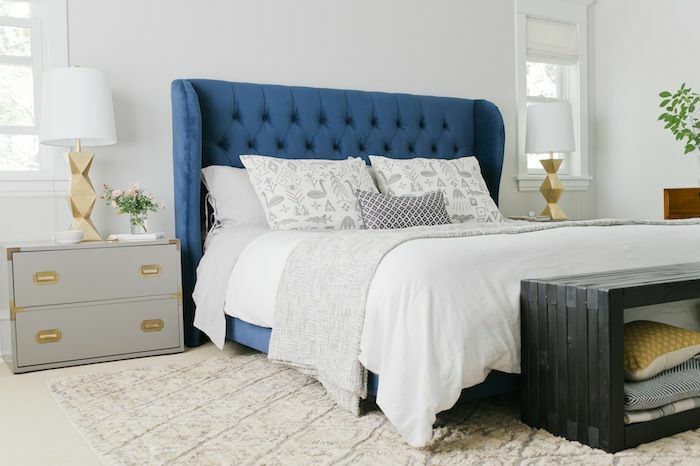 I love the color gray for clothing and wear it often, especially in the winter – there is nothing like a nice pair of gray slacks or a light gray sweater for a staple in your wardrobe – but I have to be honest, up until late I never really loved gray for home decor. So what caused the change of heart? 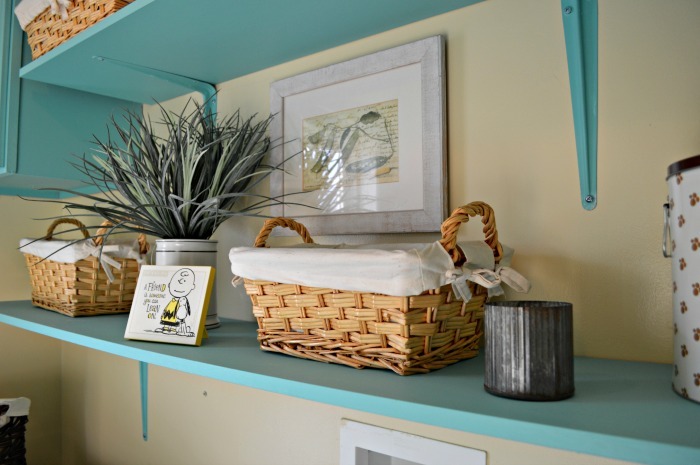 I think the big push for me was painting our mudroom Sparrow by Benjamin Moore, I did not realize how much gray made up the color Sparrow, for some reason it looked more green to me at first. But now there is a battle going on in that wing of our house between the Sage in my bathroom and the Sparrow in my hall. Since I went bold in my hall – and very bright and cheery in the Laundry room, I feel that the powder room should be more tranquil in nature. Thus why I decided to go gray, because who knew gray would now be considered a neutral? So I started my search out on Pinterest. 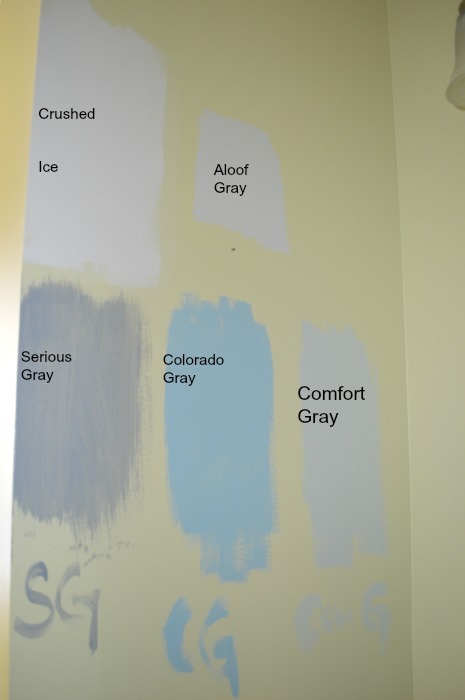 Just typing in “gray powder room” and then started looking all of the options. 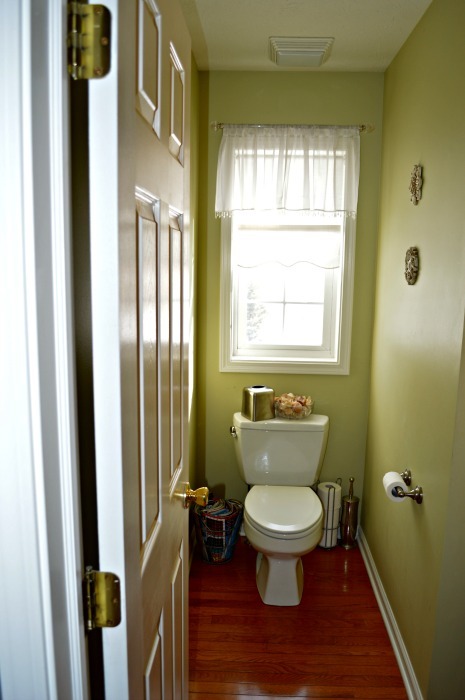 I definitely am steering more to the lighter shades of gray vs more of the dark tones, and since the mudroom hall is dark I wanted the bathroom to be light for balance. So while searching I came across this picture by one of my favorite designers Emily Henderson. 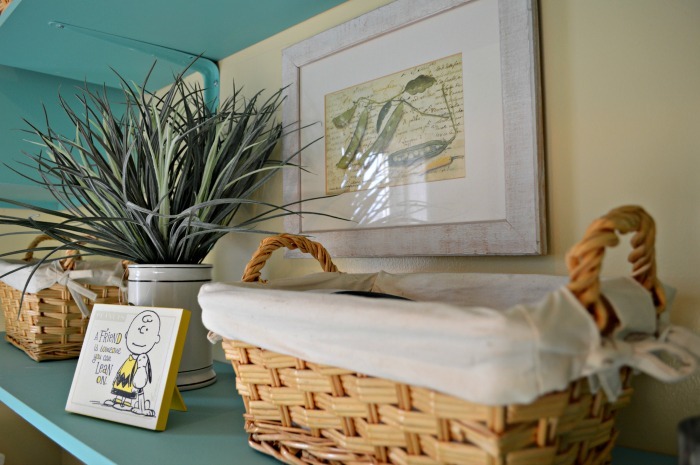 It was a picture of a bedroom she designed for this series on her blog that I loved called the Curbly Family House makeover. She worked on various room’s in the couple’s house and painted their bedroom Crushed Ice by Sherwin Williams. I remember loving this room and the giant wonderful gold mirror. I love how Emily brings in vintage furniture and simple design to a space. Then I went through the whole series again and saw this other awesome color called Aloof Gray that she used in their living room. There is something about this space that I just love – I would love to have elements of this space in my house – I just love the round coffee table and the color on the wall is so neutral you would never know it was gray – aren’t these rooms to die for – can’t you see your self living in these spaces? (sorry for some reason the image would not load). I have to say I love Pinterest. I think it is a great resource to search for ideas. I love that I can see how other people are using the item or color in a way I would like to do and it either reinforces the idea or lets me know I need to move in another direction. So last Monday morning I got up and decided to try a couple of grays out on my wall to make sure that I was comfortable with my selection. I had a couple of different shades of gray left over from other projects I used this summer. So up on the wall the following colors went. Serious Gray Colorado Gray Comfort Gray Crushed Ice Aloof Gray. Serious Gray was to dark – but love this color for an accent piece in a room – I painted a dresser this color this summer. 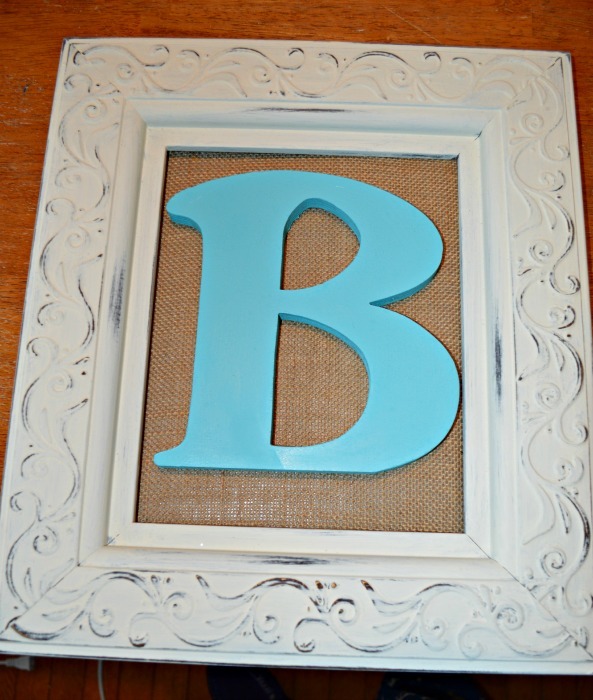 Colorado Gray was too blue – but both of the boys loved this color the best. Comfort Gray again is a nice accent color and also would not mind it maybe on a lower half of a room if the room was bigger. Crushed Ice is lighter and I thought if I painted the room all this color it might be too white against the beadboard. So I thought I would paint the top half of the wall the crushed ice and then the beadboard section Aloof Gray. So I am very excited to get started on the room. I have ordered the beadboard wallpaper from Lowes and it should arrive hopefully by Wednesday of this week. I have read online that you can’t wallpaper over semi-gloss paint so I have to research that tomorrow. Just in case, I picked up a quart of primer at Sherwin Williams today to paint the walls with it this week. The thing is we have our annual Superbowl party this week so I hope I can get the room done – if not our guests are going to see a spotted bathroom. “Mom you are not changing the bathroom again, are you? No, please tell me no!” Then Peter walked away, muttering under his breath “stop changing the house.” Peter is so funny – he is just like his Dad in that he does not like change. 1). Update the color. 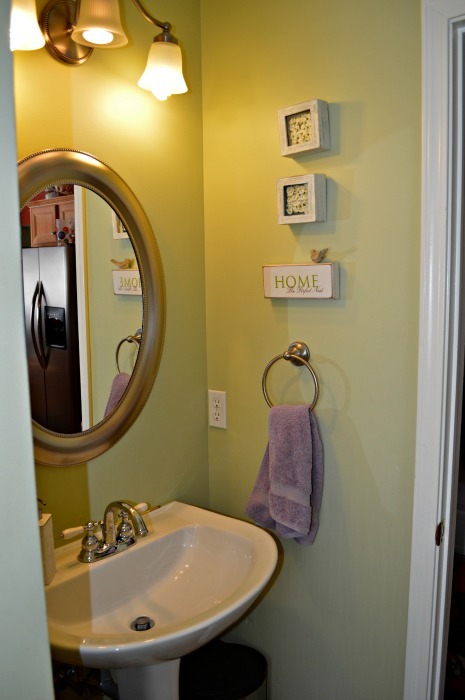 Since I painted the hallway this summer the color sparrow, it now clashes with the color in the bathroom. The light sage does not go with the grey undertone of the paint. As I mentioned awhile back I thought sparrow had more of a green undertone but it turns out it was grey. 2). Add beadboard. I was originally going to do wood but after more research and the size of the room I will be doing the beadboard wallpaper instead with a wood trim about half way down the wall. Since my sister is in school I might have to wait on the border for a while and just go ahead and paint the space. 3). 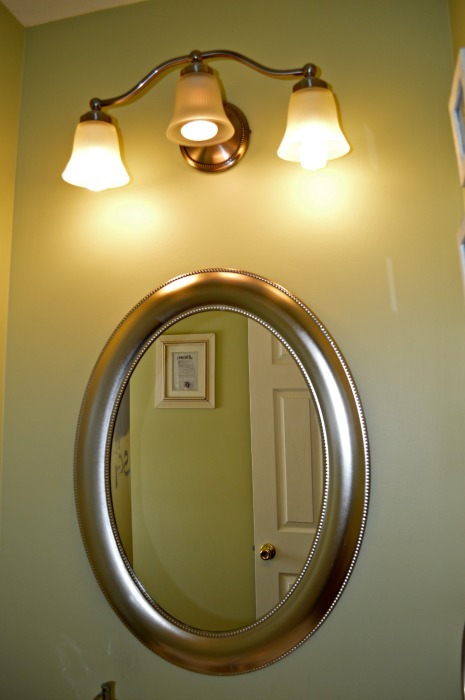 Paint the existing mirror or find a really fun vintage mirror. 4). Change out the existing light. I found this cute light at Lowes online. I got a gift card from the holidays from Lowes and it is burning a hole in my pocket so I will give it a try. 5). Find a nice area rug for the space. Either in a grey or lavender color. The only issue is the mat on the rug has to be very thin. I am leaving the cute little curtain that I bought at Kmart many years ago. I love the crystal fringe on it and it goes so well in the space. I will also keep the current accessories. I love them! So what color or shades of color do you think I am going with in the bathroom? Happy Friday Folks, we made it through another week!! I love that the weather in my area has taken a little bit of a break – so nice to be able to get some errands done and not have to worry about when the next snow storm is coming. So yesterday I asked you guys for your help in picking out which chair I should use in our guestroom. Have you ever seen the game in magazines where you have two pictures of the same thing (excluding the chairs) and you have to pick out what has changed? Were you able to figure it out? If you guessed the curtains you would be right on the nose! I first bought these curtains when we moved into our house. They were from Bed, Bath and Beyond. I love the color, but they are linen, which makes them really see-thru and they do not block out a lot of the morning sun. Our bedroom has so many windows (3 large ones) and I did not realize that there would be so much light. I ended up taking them down but I am very glad that I kept them. They have been used by other folks in the meantime. 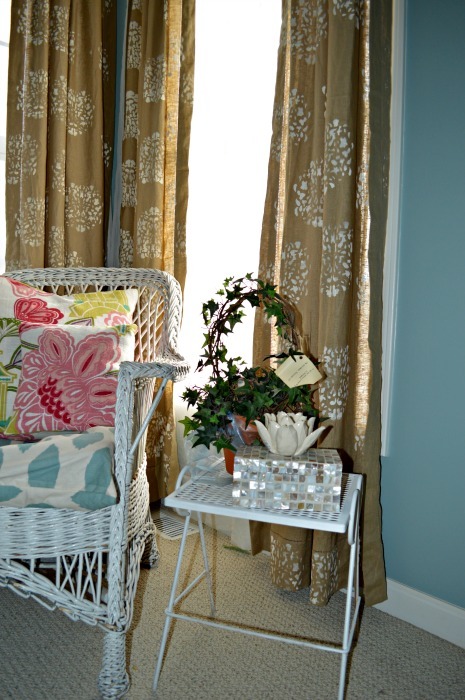 Last year when I decided to lighten up the guestroom, I had heavy, silk striped blue/grey curtains up on the windows. Though they were awesome – they did make the room very dark. 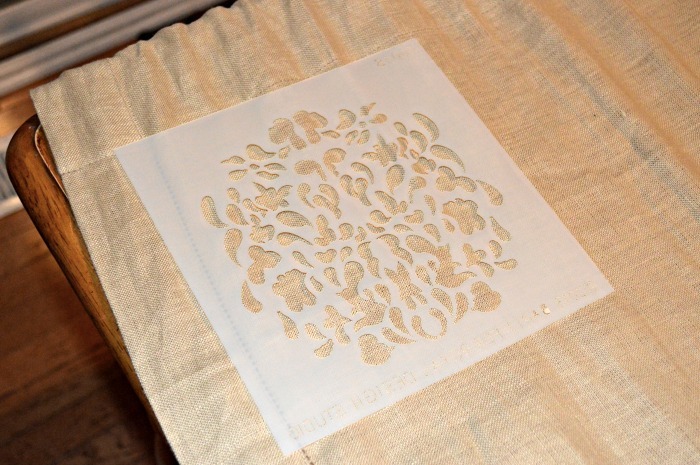 So I decided to give the old ones another whirl and add a little texture to the room with the linen material. I liked how they looked but felt they were missing something. 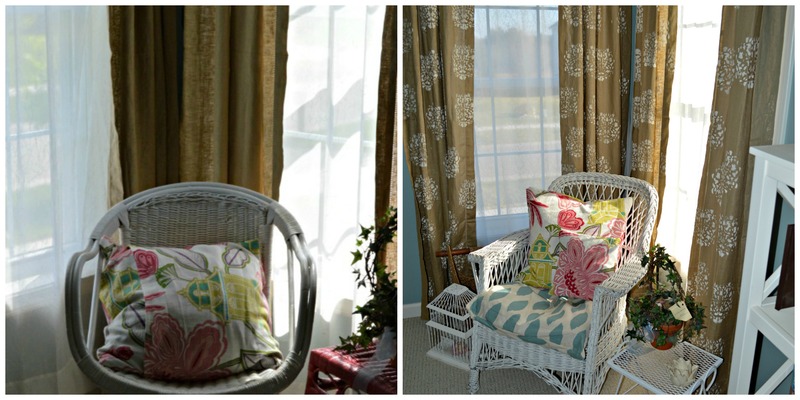 One day I was surfing on pinterest and came across this post on how this blogger upgraded her curtains by stenciling them. Here is the link to her post. This was about the time when I was on my stenciling craze. Ok, I still am…Lights went off in my head; I saw hearts and heard music playing! 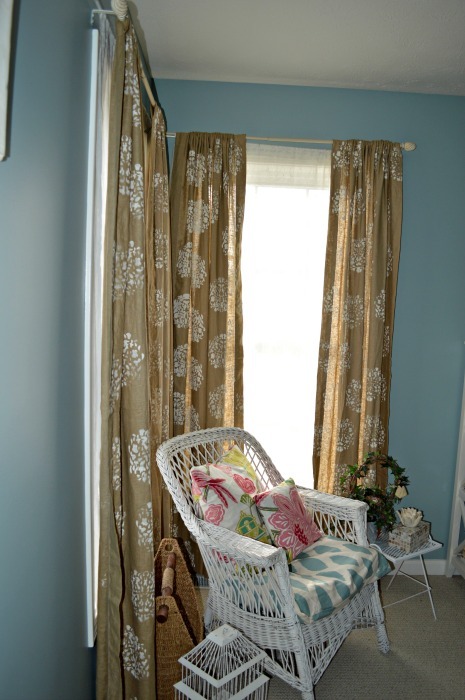 Anyway I went onto Royal Designs web site and found this cute stencil, called the Bari J that I thought would not look too big on the curtains. As usual it came quickly in the mail. 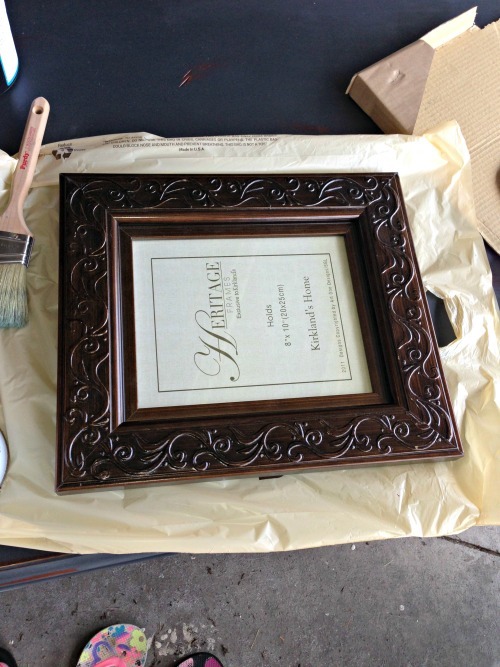 Chalk Paint – I love to use Annie Sloane and I used Old White for the project. Small paint roller – I just got this one from Wal-Mart worked just fine. 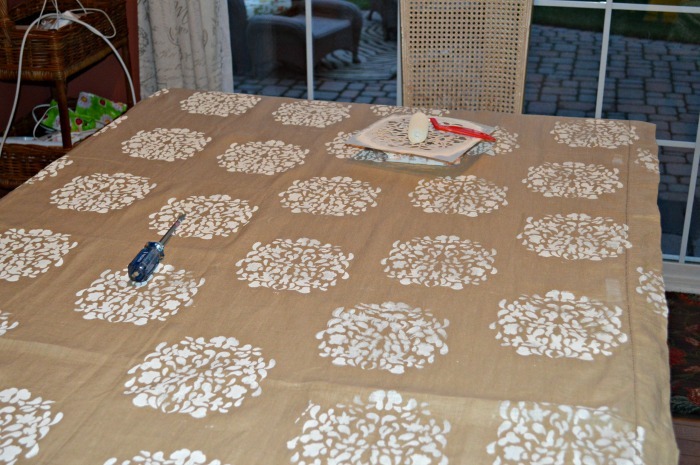 A Liner for the table or surface you want to paint the project on. So I actually did this project in November. I got up early and in my typical Type A fashion decided to go for it and give it a try. For the first curtain, it went really well. You just start in the most upper corner and start your pattern. I decided to do an up and down pattern. Start with one flower up, move down the curtain and the next flower down. So I worked across then down the curtain and the pattern worked out fine. 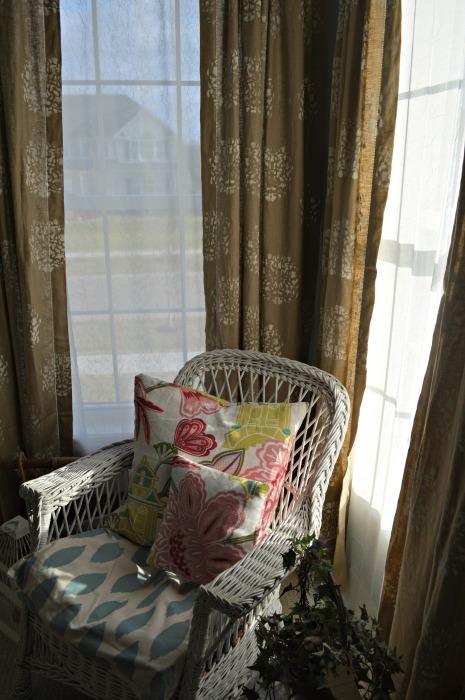 When I picked up the curtain I did not realize that the paint would seep through the material – really a silly mistake. 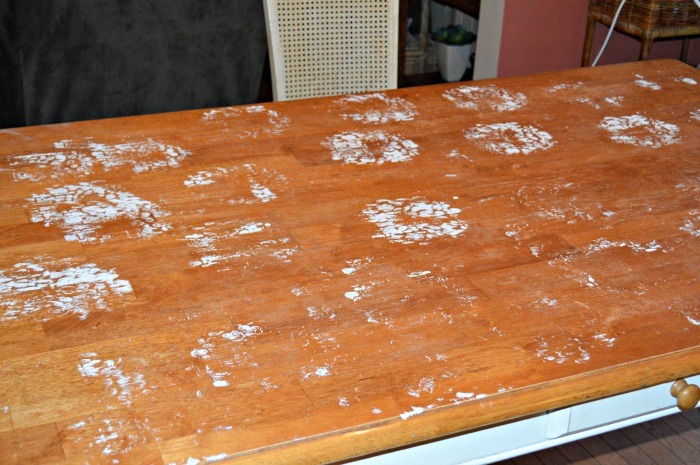 So the next time around I used a drop cloth because it took about 20 minutes of some good scrubbing to get all the paint off the table. 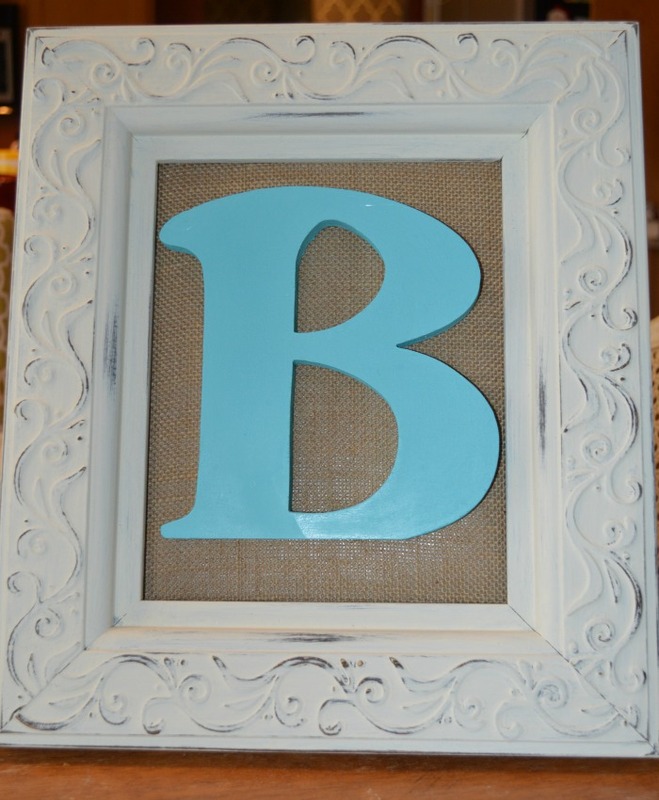 Thank God it was chalk paint and water takes it right up. 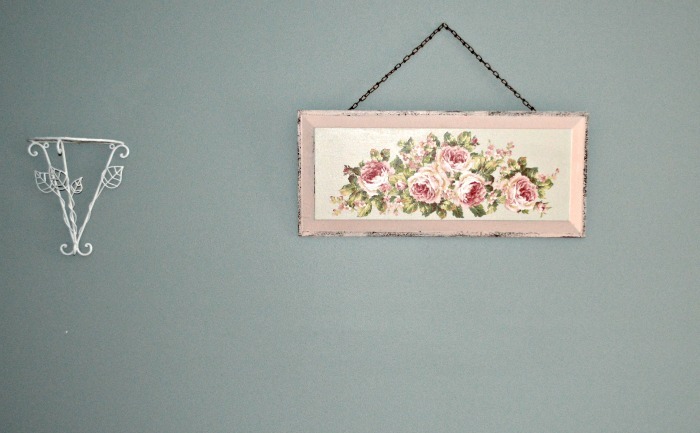 Once complete on the pattern, I just hung them right back up – the beauty of chalk paint is that is dries really fast and creates a distressed look, which I wanted anyway. 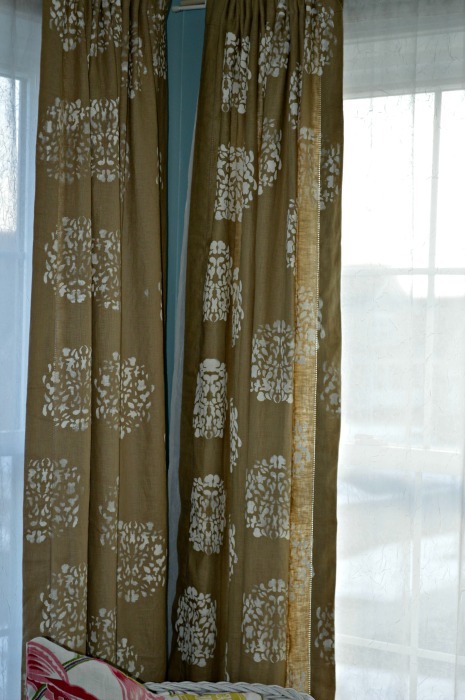 So I also found similar curtains to these in Ballard Designs these curtains go for $150 to $190 dollars a panel, I upcycled these curtains for under $25 dollars for all 4 panels, which included the cost of the stencil and the roller. I had the paint already from other projects. 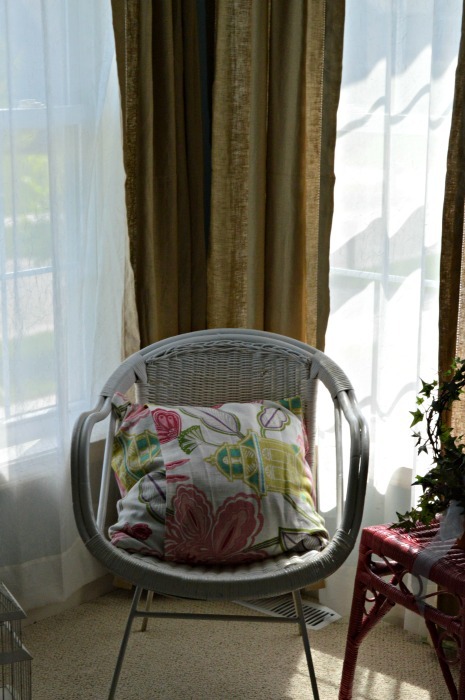 The added white to the curtains adds even more texture to the room that this space was lacking – I often feel that something in a corner needs a pattern. 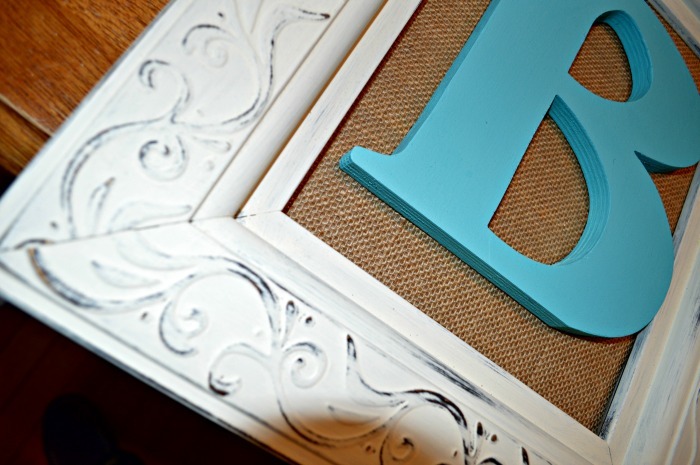 Don’t be afraid to see what you can do to your existing items in your room, it can totally change the feel. Be bold and take a risk! 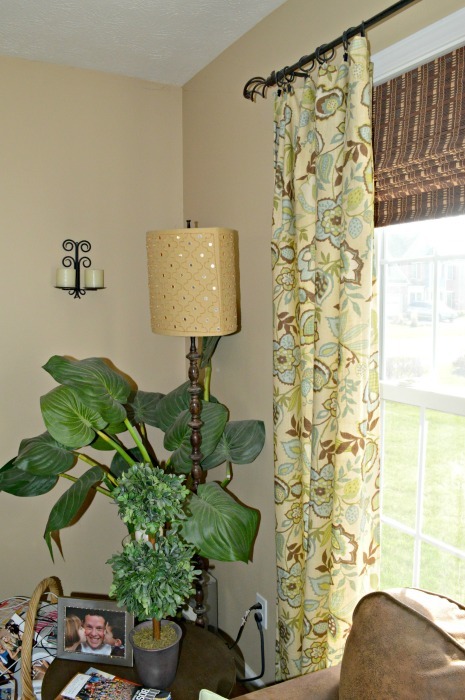 Have you ever upcycled curtains in your home, whether it be adding some fringe, or shortening them for another room, or adding another piece of material? There are a lot of options so don’t be afraid to be creative! Happy Hump Day everyone! Hope your week is going well. Don’t you feel like Christmas was like six months ago? It is amazing how quickly we have to switch gears and we are on the move again with a new year…. 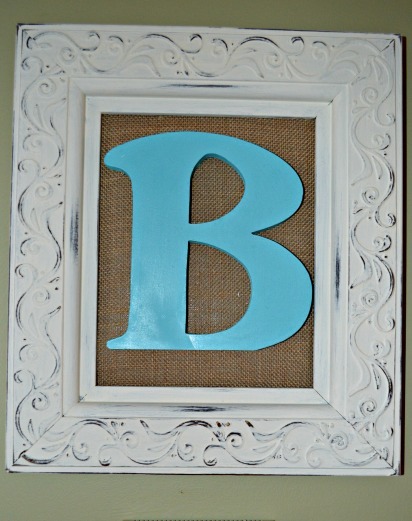 So last week one of our readers made a request on how to create a distressed sign. 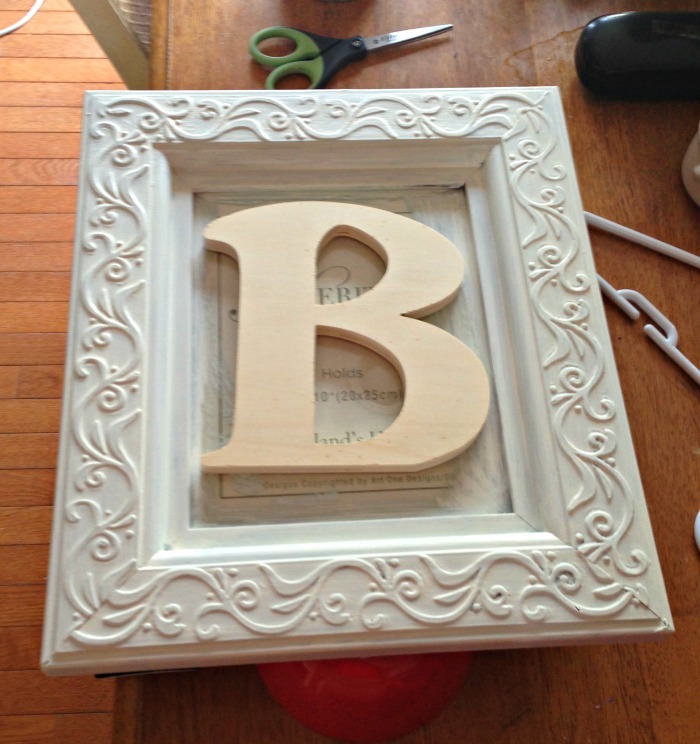 I decided to make a sign for our guestroom, which is a room that I have not really blogged about before – but look out – here comes a couple of posts about this space. This is one of the rooms in our house where I feel I have not gotten quite right to be honest. 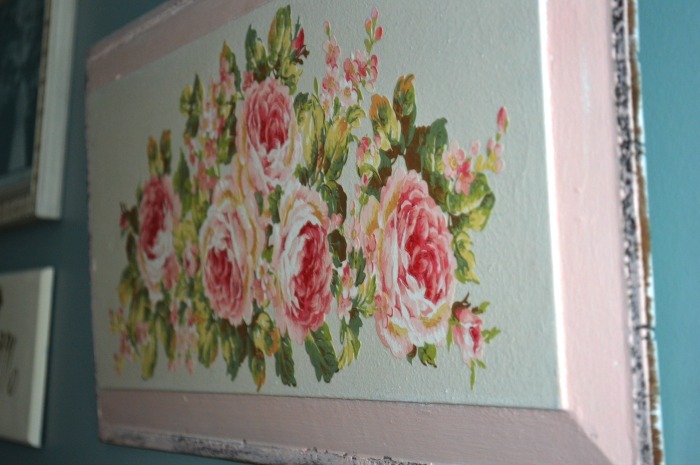 I love our headboard that we found last year on Craigslist – awesome. 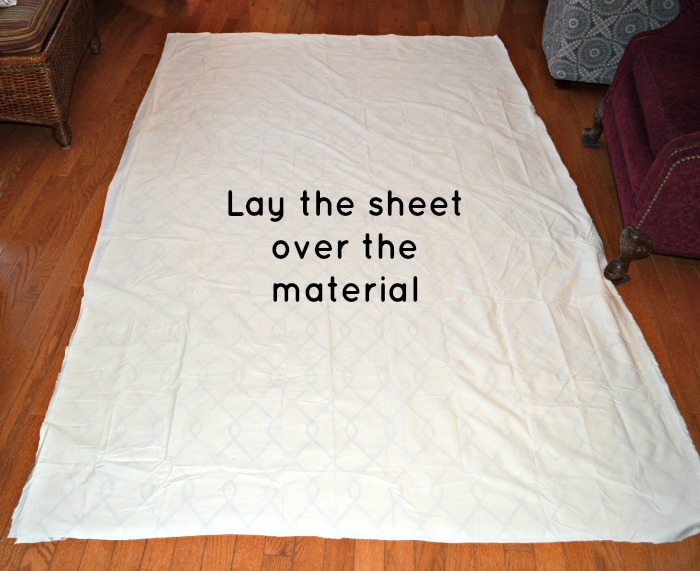 I love the awesome fabric I found to make my favorite pillows for the space – you have to love the envelope pillow…but there are a couple of areas that just have not come together. Does that ever happen to you as you are putting together a space? One of the areas that never felt finished was the large outer wall when you walk into the room. I love the vintage wallpaper piece that I found in the room, the shape of the print really requires it to be in the center of a wall. But the wall is rather big and the print looked out of place. So I decided to build around the print with additional fun pieces that mean something to the Hubby and I and our guests. 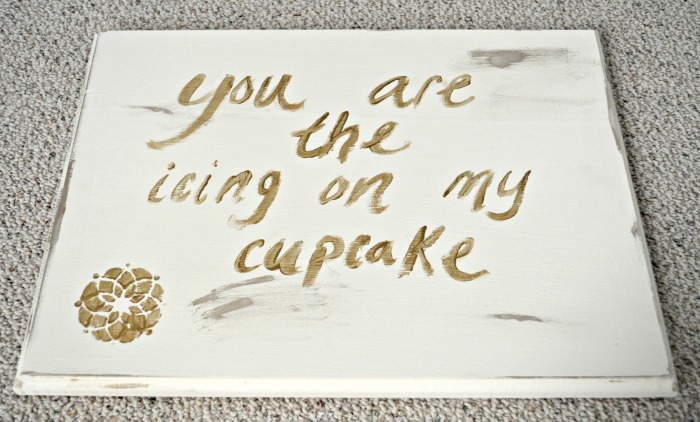 Thus the creation of the sign…fun…something personal to me, because I LOVE cupcakes and I am really loving gold accents this year. 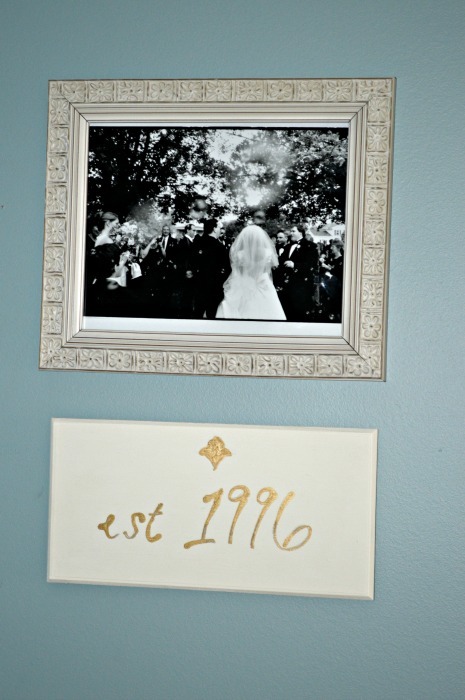 To build on that theme I added a fun sign with the year Steve and I got married, as well as my favorite photo from our wedding day, that my dear friend took. Isn’t it cool? It is shot through the bubbles we had when we left the church. I think I will need a bigger frame, but it will due for now. I found this really cute clothes rack with great vintage knobs on it from Homegoods that picks up the colors in the room: pinks, creams, taupes and golds. Finally I added a photo of flowers in a gold frame to add a little bit of solid gold to the area. The wall is not quite done, I would like to add a letter V to the wall for our last name and maybe one more small print…I will have to be on the search for that. I love putting together feature picture walls. 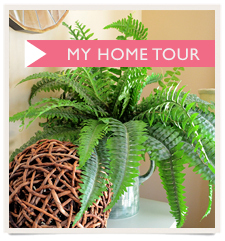 I have a couple throughout my house; they just add a little bit of history to a space within your home. 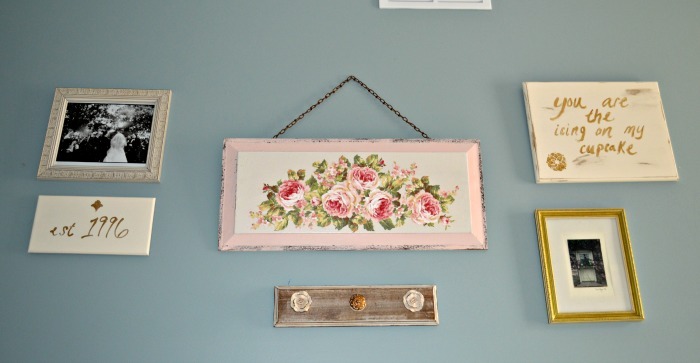 Do you have picture feature walls in your home, what elements do you use to bring the wall together? Hope everyone had a great weekend! We actually had a mid January thaw this weekend and could just go outside in a fleece vs dressing like we lived in the arctic. I have to apologize folks I am one week into January and already did not live up to one of my New Year’s resolutions of having 4 posts a week. Last week I had to put out a couple of unexpected fires that took up more time than I thought – all is ok…but took time away from the blog. So let’s see if I can get my act together this week. So when you go to the store, don’t leave your hubby home with a drill and an action item to hang cabinets. Let me explain, the next stage in the laundry project was hanging the cabinets. I painted them Cooled Blue #6760 by Sherwin Williams, love the color. As you remember I was hoping to match the swatch from the utility sink skirt but learned you could not use fabric. So after looking at various swatches found Cooled Blue to be a good match. So I was waiting for the Hubby to research how to hang cabinets since neither of us have done it before. After reading a couple of posts Steve got the courage up to give it a whirl. I briefly talked to him about my vision: I wanted the two cabinets hung on either side of the wall with shelves in between. You can see here Steve’s approach to how he hung the cabinets – pretty inventive I have to say. My Dad came over to give him a hand, and of course I needed to run up to Wegman’s to get some food to feed the men. When I got back the cabinets were hung, and hung way too high. 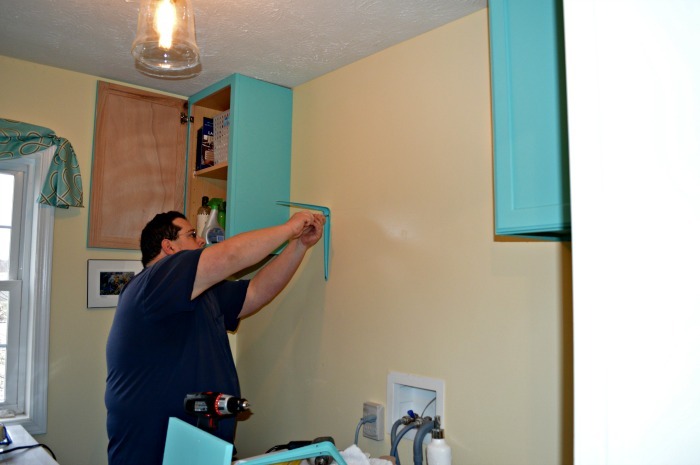 Now a little bit of history about the Hubby – he is not a Type A personality at all – he is so the opposite way that I thought for sure the cabinets would still be on the floor. BUT no, he went Rogue on me and hung them without me making sure the height was ok, very unlike him. So I was a little taken aback to say the least, and they did not look right at all, but I felt really bad since he was so proud of himself and what he accomplished to make him move the cabinets down. So I had to rethink the layout of the wall. My Mom suggested a longer shelf lower on the wall to anchor the upper cabinets and then we just add a smaller one on top. I already made a cute little step stool for the space so I could use that to access the upper shelves. So off to home depot I went and bought two shelves for the space 12 inches deep. 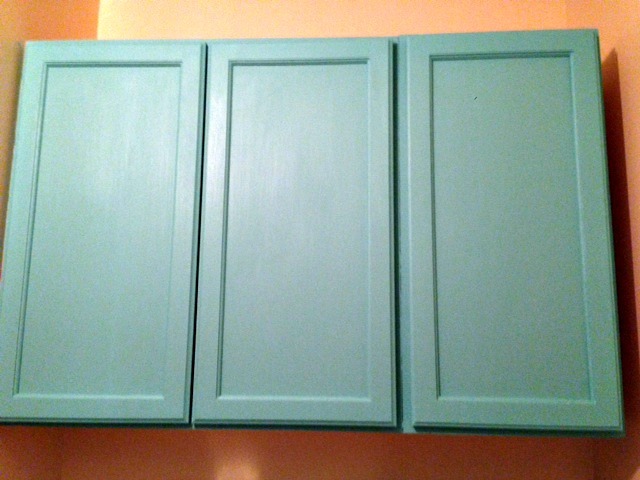 I decided to paint them the same color as the cabinets. 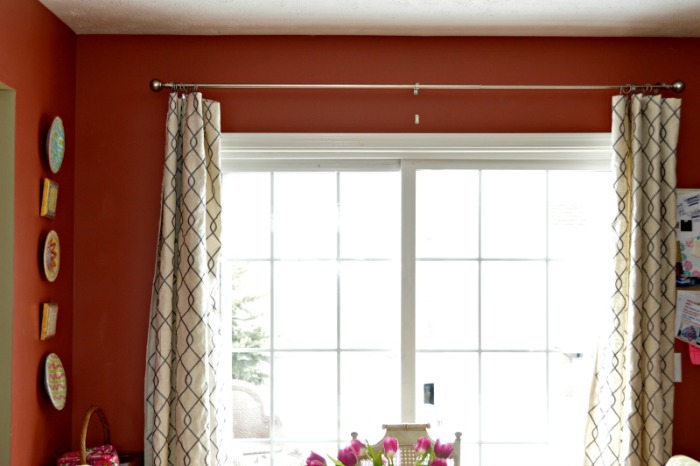 When creating a wall like this it will be too busy if you introduce too many colors to storage elements. Ideally I wanted to have wooden brackets, for some reason, we could not locate wooden brackets with a 12 inch depth. We found a lot of 9 inch, but we discovered that if we wanted 12 inch it would be a custom order and would take two weeks. As I have stated before, I am NOT a patient person. In fact, driving to the store to buy brackets takes too long. 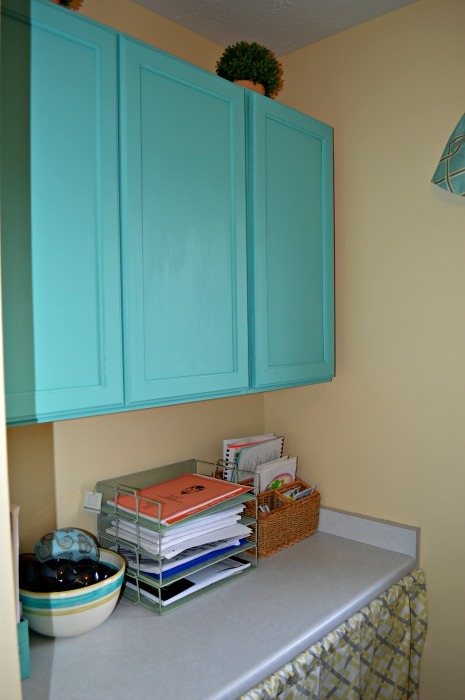 It was very frustrating, but since this was the laundry room and not the kitchen I went with the metal brackets and just painted them the Cooled Blue as well. 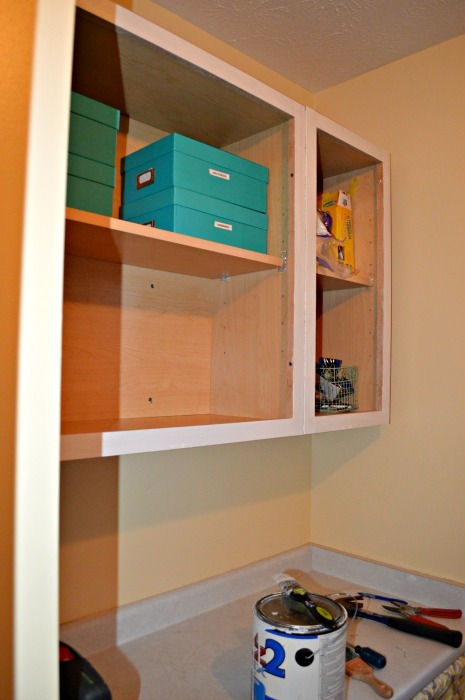 I love the open look of the shelving and I actually am starting to really enjoy the cabinets at their current height. It definitely offers more storage then we had before. I had all the baskets in the laundry room and in other areas of the house, so I did not have to buy new baskets for the shelves. 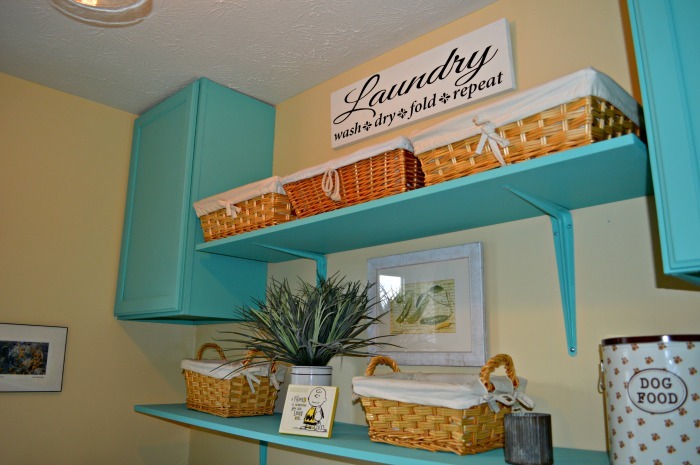 I did add some fun new accessories like the laundry sign that I found out on Etsy. 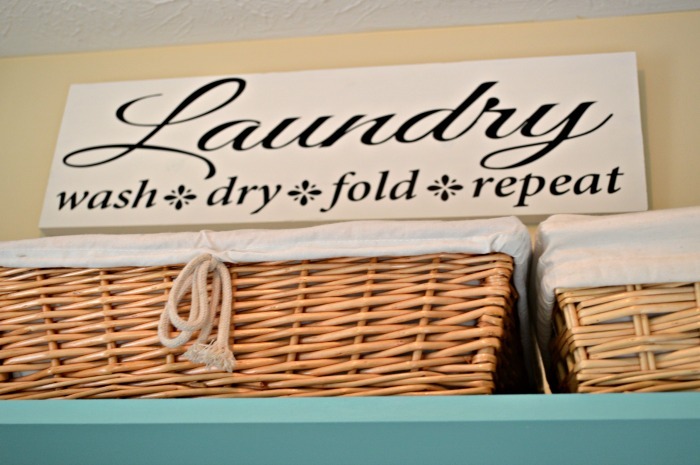 Doesn’t this sign say it all, wash**dry**fold**repeat – no closure when it comes to laundry I am afraid folks! It fits perfectly between the two cabinets and I had this cute print from our first house that I bought maybe 13 years ago from a Laura Ashley store. The knobs that I had planned to use on the space did not fit, so I am kind of liking no knobs at the moment and it if I find something really unique and cool I can always add that later. 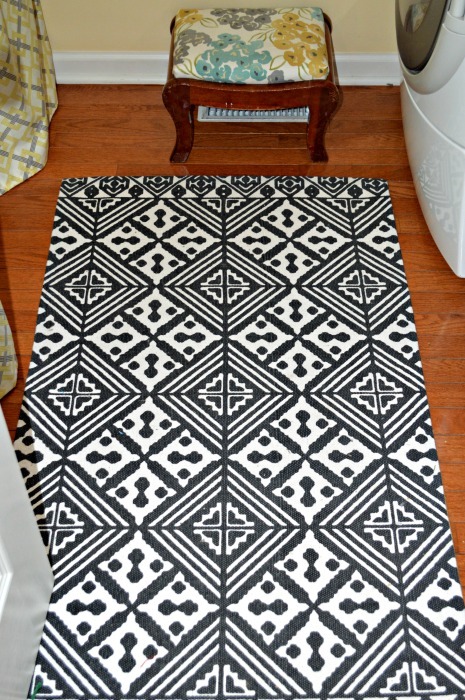 The rug I had purchased earlier this fall at Homegoods when I was making the skirt for the utility sink so I love the geometric shape and the black tones and how it anchors the space. I also decided to replace the open shelving on the opposite wall. I really like the closed-door look and it gave us more space for storage. Space and efficient storage is my motto for 2014. 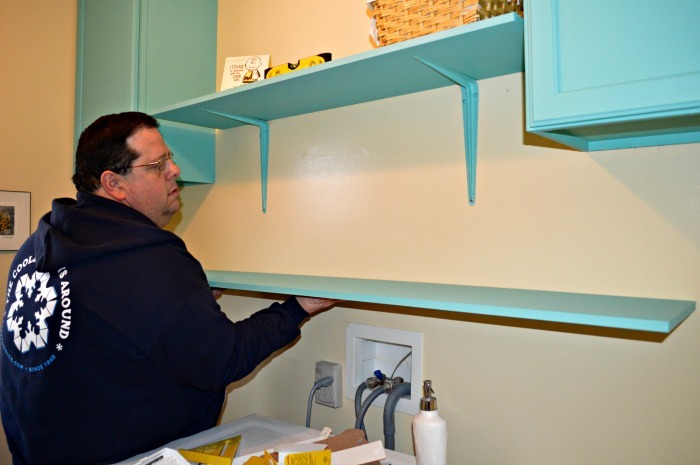 Steve did a great job hanging these cabinets and we are starting to work really well together at DIY projects – no four-letter words for this project! I also took this opportunity to really look at what I had in this room. I cleaned out all the baskets and shelves for items we really needed. I got rid of items we did not need. All and all the room has come a long way and went from a messy space to a functional yet inviting area to be in. 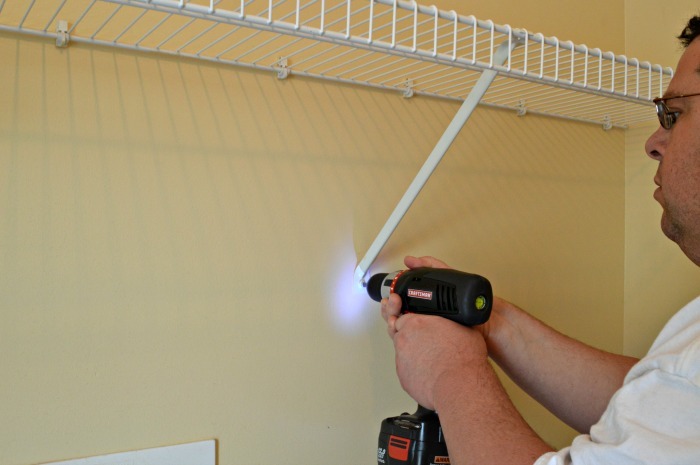 Have you ever hung cabinets, has your husband ever gone Rogue on your Honey-Dew list before? Of course, she had the whole thing already planned out in her head. Two cabinets on one side of the room and 3 on the other side. Chernee had done some minor improvements in the laundry room already, but this was going to be BIG. It meant taking down existing shelves without destroying the wall (something that I do not guarantee in any of my work) and hanging up wooden cabinets. We were not changing the paint color and we had some left over from our first paint job for touch ups, so off we went! 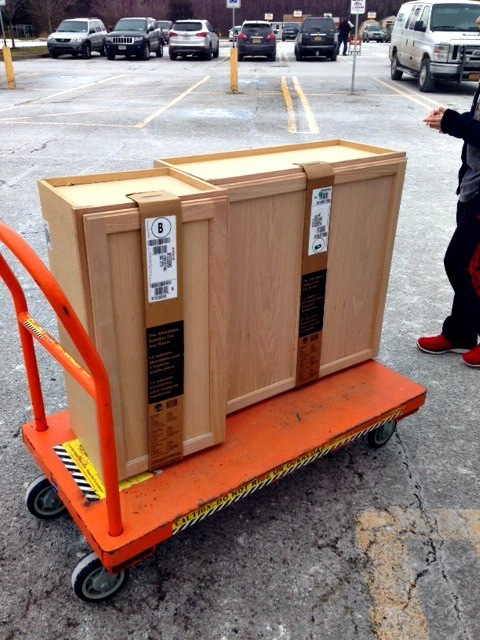 We went to Home Depot, and purchased unfinished wood cabinets. We bought 2 that were 18 inches wide by 12 inches deep by 30 inches high for the wall above the washer and dryer. Then, for the opposite wall we bought 2 cabinets 30 x12x30 and a smaller one 12x12x30. All together, we spent $200 on the five cabinets. 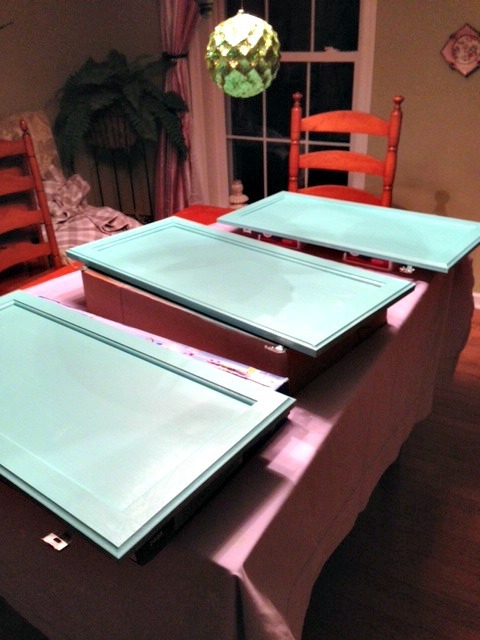 We got them home, I took off the doors and Chernee got to paintin’! While she painted, I began the path of destruction, or, as others call it, taking the shelves down that were in there. The main shelf over the washer dryer came down without incident. I am not sure how! The shelves on the opposite side came down rather easily because I hung those in the first place and let’s face it, and some point they would have come down on their own. Now, there were instructions that came with the cabinets, and they mentioned the use of a “cabinet rail” in installation. 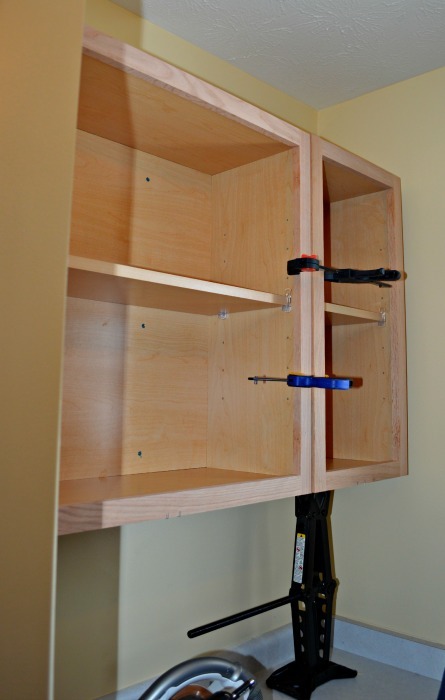 Basically, you hang the cabinet rail on the wall and then attach the cabinets to the rail. This probably provides a more secure installation and provides some play in making sure the cabinets are flush together on their face and line up correctly. Well, I didn’t have a cabinet rail, or even know what one was or how to install it, so we ended up using another construction technique called “winging it.” Spoiler alert: It all came out OK anyway. 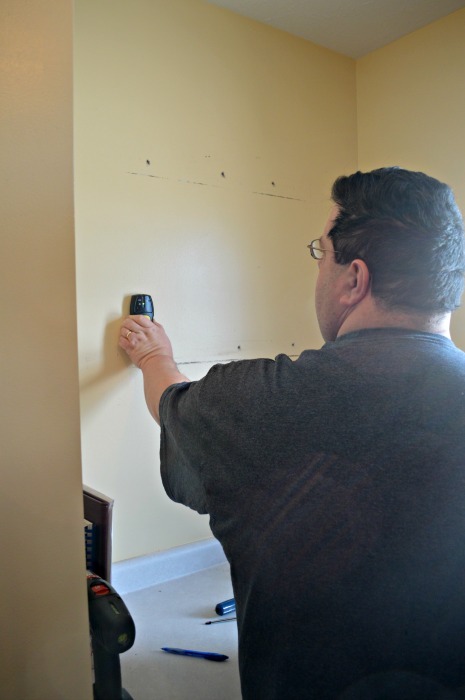 The first task was finding the studs…..no, not me! (Ha Ha – that might be the oldest joke in home improvement, sorry) We needed to find the studs in the wall to make sure we could attach the cabinets right to the studs. If we secured the cabinets to the drywall we would have really huge holes in the wall and broken cabinets on the floor. So, I used my trusty stud finder to locate the studs in the wall and marked them so we would know where to put our screws. At this point I should mention that I enlisted a helper for this job. Chernee’s dad, Neil, came over to assist due to the heavy nature of the wood cabinets. 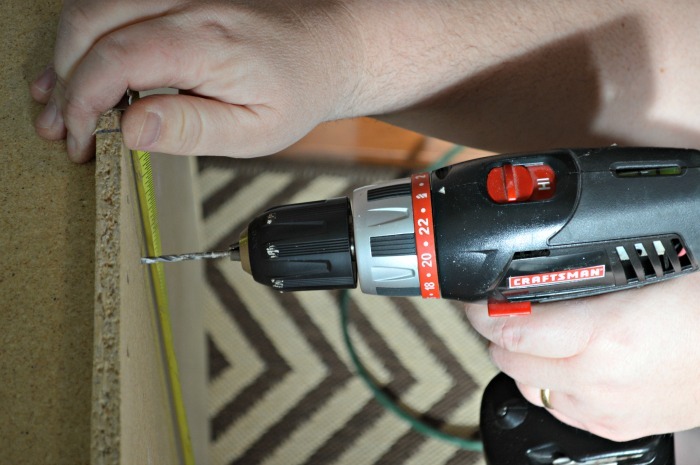 Once we had marked the studs on the wall, we measured on the back of the cabinets and pre-drilled several holes in the cabinets so when we were holding them up to the wall we would be able to quickly drive a screw through our pilot hole into the stud to secure the cabinet. Neil and I started on the larger wall above the washer dryer. 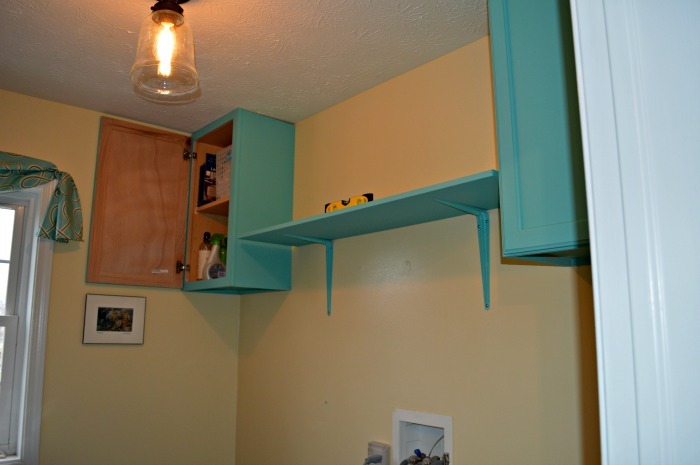 Chernee wanted to have two cabinets on this wall and hang shelves in between. In our original discussions, Chernee mentioned she wanted the cabinets on this wall to be up flush with the ceiling to ensure we had enough clearance over the washer and dryer. (NOTE: our house has standard 8 foot ceilings). So, Chernee went to run and errand with Fix It Franny, and while the two of them were gone, Neil and I decided to get to work and see if we could hang both cabinets while they were gone to surprise them. Well, they went up fine! Neil held the cabinet flush up to the ceiling while I drove 4 screws in each cabinet into the studs. No problem! This improvement stuff is easy! Chernee and Fix It Franny came home, looked at the cabinets and said “Wow! They are really high! I mean, wow, those are really really high!” The cabinets were really high. Putting them flush up to the ceiling ended up being a mistake. The second set of cabinets went up even easier! 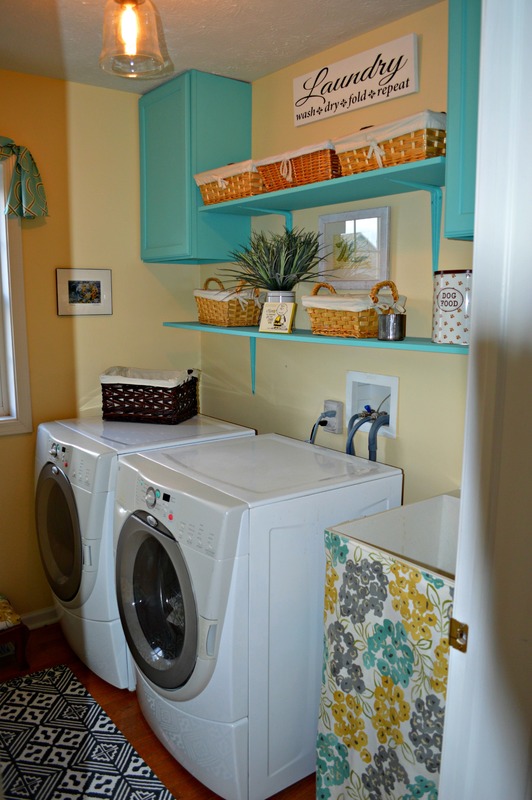 I did not have my strong helper, but on this side of the laundry room there is a countertop installed that I was able to use to make the hanging easier. 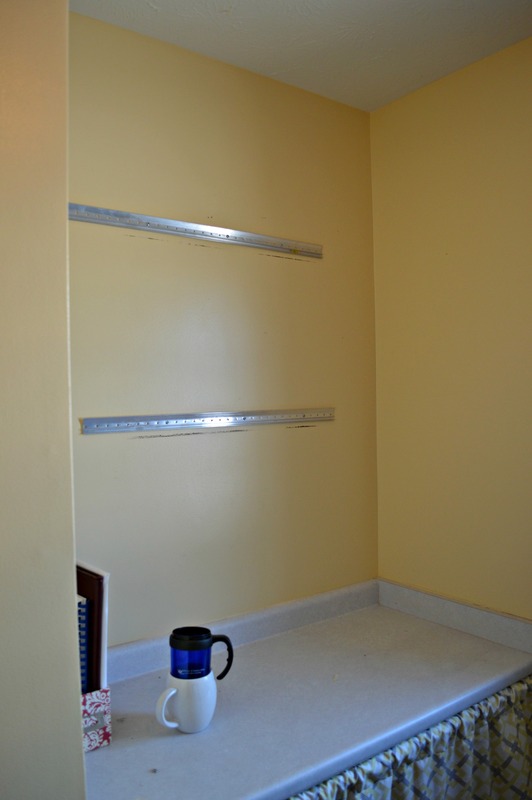 Chernee and I “corrected” the cabinet height on this wall and hung them at a lower level, about 12 inches lower. So, on this wall the cabinets are normal height as opposed to the Kareem Abdul Jabbar height of the other cabinets. We were hanging them lower and I had this countertop to help me, but I still had the issue of needing someone to hold the cabinets while I drove in the screws. They are too heavy for Chernee to hold in place by herself, and I needed them to be at the exact height she wanted. The only solutions I could think of were get a piece of 4×4 and cut it (fingers, blood) to the exact height, or, find something strong enough to hold the cabinet and also be adjustable. And then it hit me! A car jack! 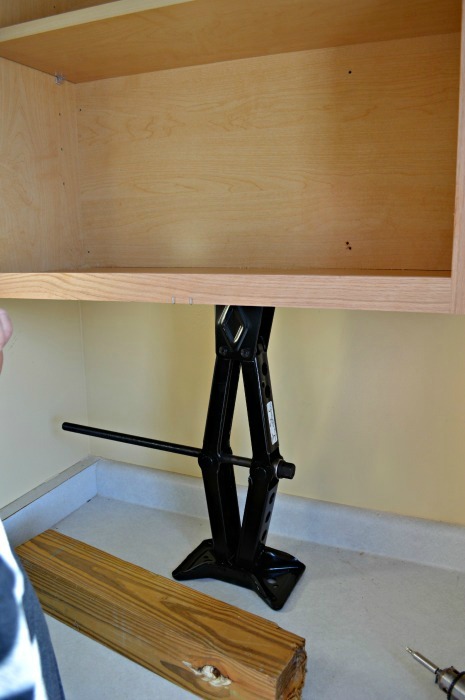 If a car jack can lift up 2 tons of car, it can hold my 30lb cabinet. And, it’s adjustable! Brilliant! I got the car jack out of the trunk and set the cabinet on top and raised the jack into place. It worked great! The jack held the cabinet in place and I secured them to the wall, lowered the jack, and away we went. I think the cabinets came out great, and it makes the room more functional and look better! Double bonus! Now I am off to fix the annoying squeaks in our bedroom floor……. P.S. 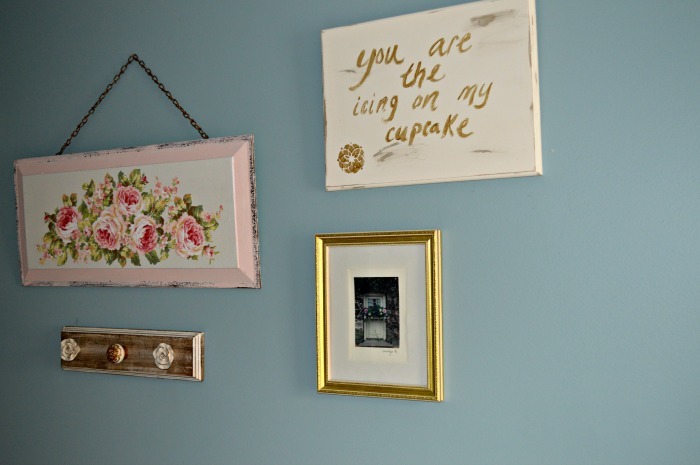 The whole room reveal will be up next week….we are still putting items away and catching up on laundry! Can you color match with fabric? 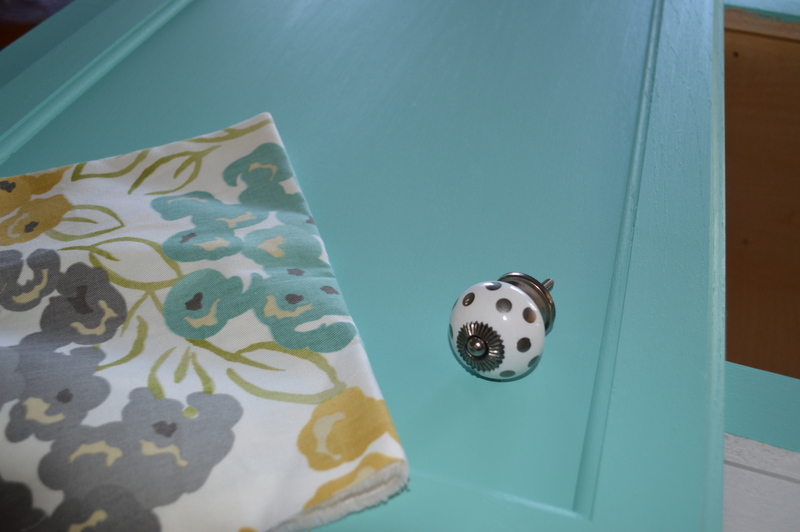 I think it is no secret that I love paint, and looking a new colors and how I can add them to our home. I actually had to create a section in our basement to store all the great colors that I acquired this year!! Anyway, with all the brands of paints that I have tried this year, for latex paint I really enjoy working with Sherwin Williams. I am impressed with their quality, coverage and willingness to help the customer. 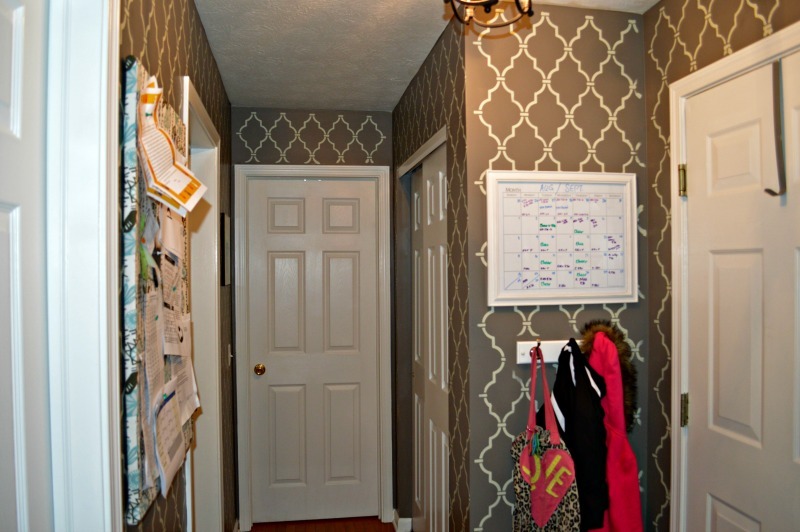 So this fall I fell in love with this fabric for the laundry room and it became the starting point for the redesign. 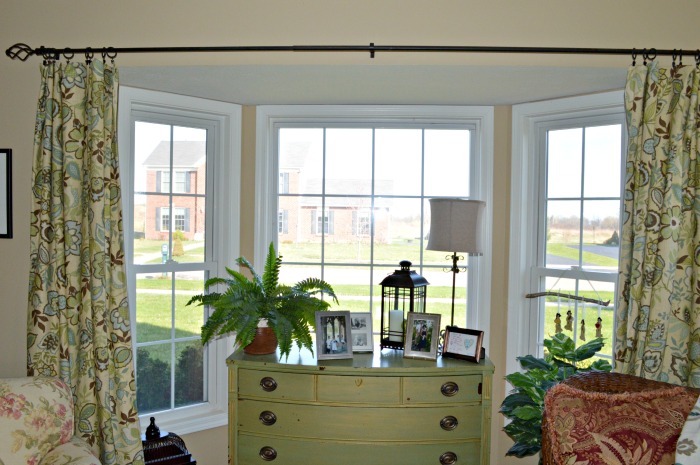 It had the yellow of our current walls and the grey that pulled and tied into our newly painted hall/mud room. I wanted to pull one last color from the space and that was the turquoise/teal color that is in the flower of this fabric. I went down to our local Sherwin Williams store with my swatch. I was really impressed with how they recently matched Emma’s room color to help me out when I had some minor touch ups to do. 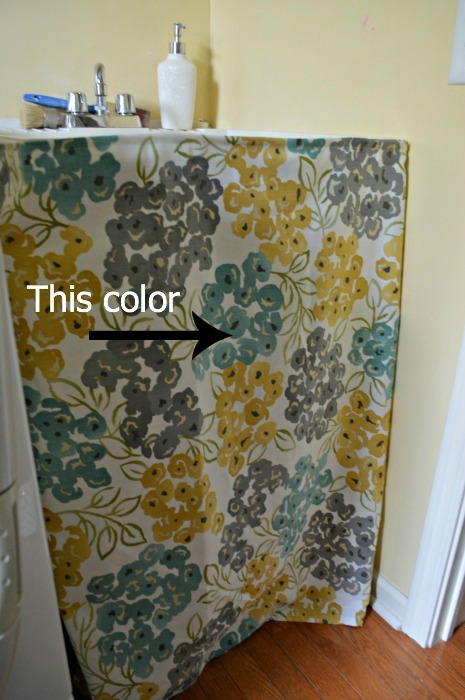 What I learned though is that you can’t color match paint with a fabric swatch. It has to be a flat surface. Material has too many ridges in it so the machine can’t get an accurate read. Naturally, I was a little bummed, then the manager whipped out their color swatch book and off we went trying to match the color that way. I have to say that we hit it pretty close. 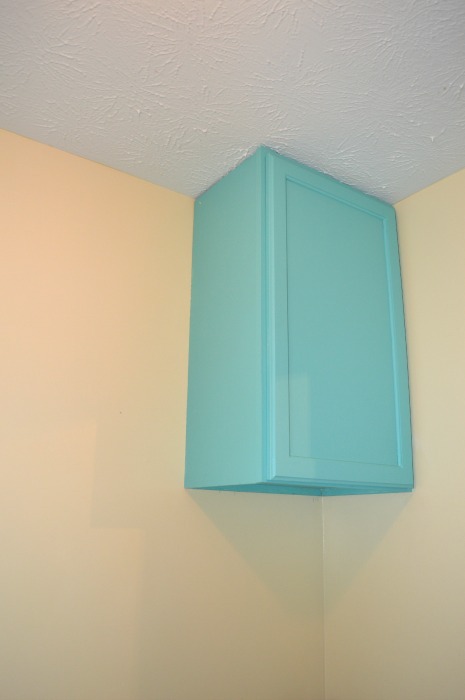 I went with a matte finish so the cabinets were not too glossy in the small space. I only had to buy a quart because I was only painting the two shelves and the cabinets. So all in all the paint really matched well in the room. 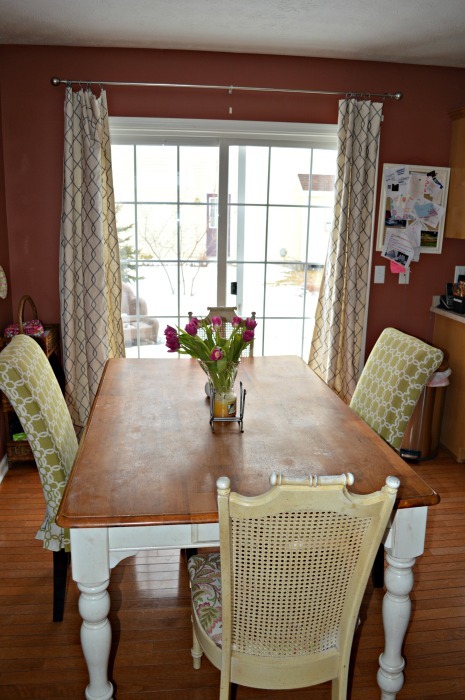 It plays very well with the existing paint and with the fabric in the space. So, for future reference you can definitely use fabric to inspire the color of a space you just can’t use it as a matching tool.